You know those moments in sitcoms where all the elements of a punchline have been established (ie small dog, an engagement ring and some dog food) without you noticing, and then just before it all happens, you realise and watch in horror as it does? Well, Meet The Parents is more than a bit like this. Ben Stiller plays the unfortunately monikered Greg Focker (the main source of jokes, and one that proves surprisingly durable), very much a usual Stiller character. Perennial nice guy, hopelessly in love with a lovely girlfriend (Polo), with a slightly darker edge. Anyway, noticing the actions of his girlfriend's sister's fiancé, he decides it is only honourable to ask her father if he can marry his daughter (bravo). In his attempts to do this though, Greg discovers that her father is an ex-CIA spycatcher and that he hasn't taken a liking to him. Increasingly outrageous situations thus occur, involving cats, drugs, cesspits and the 'circle of trust', over Greg's weekend of hell. 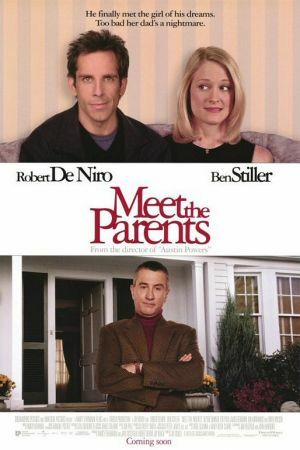 Shot through with a deliciously black humour, Meet The Parents is a crowd pleaser in every sense of the word, with that little extra twist. The film doesn't resort to straight out gags, revelling instead in a consistent bombardment of amusement that will leave you smiling and cringing throughout. A little gem.